This article is about the Virtual Boy game Mario's Tennis. For the Nintendo 64 Mario Tennis game, see Mario Tennis (Nintendo 64). For the Game Boy Color Mario Tennis game, see Mario Tennis (Game Boy Color). 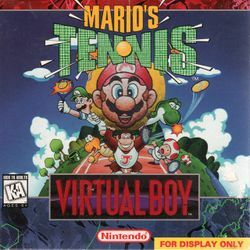 Mario's Tennis, initially known as Mario's Dream Tennis during development, is a game that was released as a launch title for the Virtual Boy in 1995. It is the first tennis-related Mario game, and would later be followed by the Mario Tennis series. All playable characters that appeared in Super Mario Kart for Super NES (with the exception of Bowser) were also playable in Mario's Tennis. 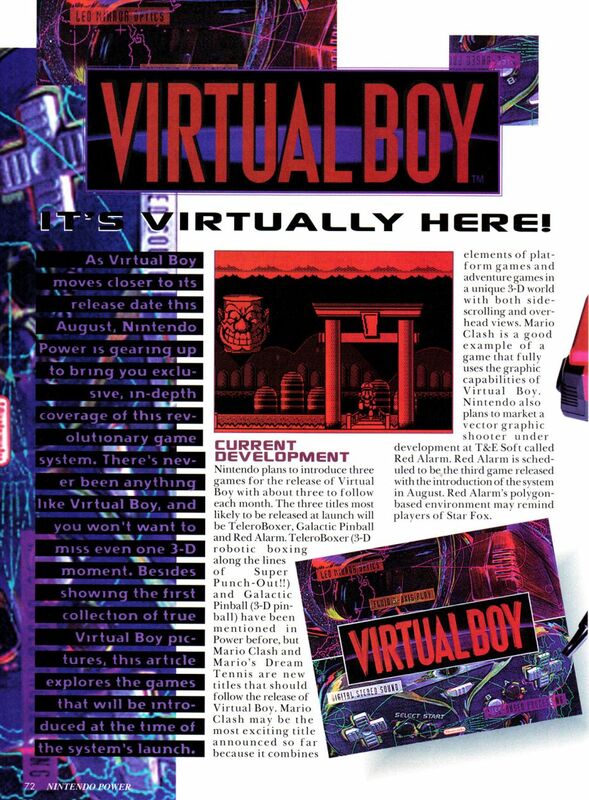 The cable that would have been used to connect two Virtual Boys together was never added due to poor Virtual Boy sales. A serve begins each point in tennis. A single player serves each game, and players alternate serving throughout the course of the match. If the player wishes to serve, they must press either the button or the button, for regular shots and for long-distance shots. The basic shot in in Mario's Tennis, this shot has a higher arch to it, and can be used by pressing the button. The shot is mainly used for regular, run-of-the-mill shot. The Lob Shot is the second method of hitting a ball in Mario's Tennis. The Lob Shot is a powerful shot that can be used to shoot high, powerful shots whenever the button is pressed. However, the Lob can be a disadvantage if the character hitting the ball is in the front of the court. Doubles is the second method of play in Mario's Tennis. Doubles are very different than singles, and can be a great advantage for beginner players. In Doubles, the player can choose a partner to help them play tennis, while the player serves in the back the computer partner covers the net, and vice-versa. Evidence of the beta character "Cassarin", through a game rip. The character list in this game's ROM features the name "CASSARIN", which is notable for, unlike the other characters, not having any sprites. "Cassarin" is an alternate romanization for "Catherine", which is Birdo's Japanese name; it can therefore be assumed that Birdo was initially planned for playability in Mario's Tennis. Mario's Tennis received generally mixed reviews from critics. A common complaint cited by reviewers was the fact that it was a tennis/sports game that lacked a multiplayer mode. 1UP.com praised the game's 3D effects, but criticized the game's lack of a multiplayer mode, or much to actually accomplish in the single player mode. Nintendo Life gave the game a 7 out of 10, calling it a "solid, if simple, tennis game" that processed "Good music and graphics combined with...excellent 3D effect", though they too felt the game was held back by a lack of multiplayer mode, and a lack of characters, which lead to the tournaments being too short. IGN's Patrick Kolan compared the game to Wii Sports, another one of Nintendo's pack-in games for one of its consoles, the Wii, in that it showed off the system's unique strengths, but suffered in regards to non-impressive graphics and a lack of long term game content. Games Radar echoed these sentiments, stating "Gameplay was rudimentary, and lacked all the flash and silliness that came to define the Mario Sports series, but as a 3D showpiece it worked fairly well". Famicom Tsūshin scored the game a 26 out of 40. The Rome News-Tribune referred to Mario's Tennis as "the only decent stab of tennis" prior to the release of Sega's 2000 Dreamcast game Virtua Tennis. This is the first of one of the two only Mario Tennis games where Mario and Luigi play the sport in something other than their regular shirt and overalls, with the second being Mario Tennis Aces. This page was last edited on March 6, 2019, at 19:20.